Diego Ulissi will racing shortly after his ban ends in March. For some this appears to contravene the MPCC’s rules and the group today said it wants to check Ulissi’s situation. This in turn upset the Lampre-Merida team who in press release tennis, smashed back their response. Amid all this there’s a lesson: any rider in the pro peloton is taking risks with a few puff on a Ventolin inhaler as studies show it can bring about large doses in excess of the WADA threshold. Diego Ulissi was provisionally suspended last June following a sample from a test in the Giro showed an elephantine dose of 1900 ng/ml of salbutamol, a banned substance (more of which below). Before this he’d won two stages of the Giro but note he was tested following these stage wins and passed. He admitted using salbutamol to treat asthma during the race and indeed quit the race later on complaining of bronchial problems. The case dragged on, so much so that his team provocatively decided to enter him into a race last September which saw the UCI and the Swiss Federation (Ulissi is Italian but lives in Switzerland) swing into action. The delays continued with a ruling expected late in 2014 finally arriving on in January where Ulissi was given a nine month ban by the Swiss Olympic committee backdated to the start of his provisional suspension in June. The MPCC group has a rule that states teams cannot hire riders who have been suspended for more than six months for two years following the end of their period of ineligibility, effectively a four year ban in place before WADA brought in a four year ban for 2015. Ulissi is cleared to race with Lampre because they are not hiring him, he is on the roster and has been all the time. Visit the UCI website today and you’ll see Ulissi is on the Lampre-Merida roster, albeit with asterisks next to his name to denote his present ineligibility to race. All the MPCC need to do is call the UCI or check the contract with Lampre. Remember not every rider who tests positive or gets a ban is fired by their team. Fränk Schleck was ejected by Radioshack but it’s not automatic. For example the Garmin riders while quietly serving their USADA bans or see Filippo Pozzato who served a three month ban in 2012 for working with Michele Ferrari but stayed with the Farnese Vini team. The MPCC rules need some reworking, especially the English translation is confusing at times, for example using the word “enter” for the French engager, to hire. It pays to read the original French rules but this doesn’t excuse the clumsy English version. Salbutamol can have an anabolic, muscle-building effect which is why its banned. But it is the ingredient in popular anti-asthmas treatments like Ventolin, a medicine often consumed by the small hand-held puffer. What is still unexplained is how Ulissi ended up with such a big dose. The decision doesn’t seem to be on the Swiss Olympic website. However staying in Switzerland there have been studies on the use of Ventolin, a “puffer” containing salbutamol and it is possible to get very high concentrations of the substance, far in excess of the set limit to trigger a doping test, even when using Ventolin under a prescription and Therapeutic Use Exemption (TUE). The chart above is taken from this study and I’ve added the red line to show the WADA limit. 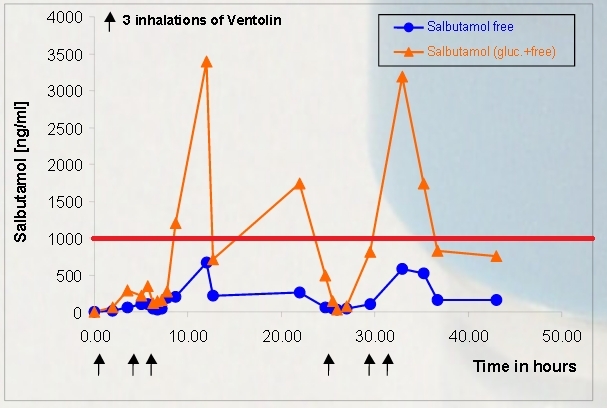 Each black arrow marks an athlete taking three puffs on a Ventolin inhaler and the orange line shows the measured dose in the urine. Put simply nine puffs during the day appear to be enough to go well over the WADA’s red line. If this is replicable in other athletes then anyone using Ventolin, even if prescribed and agreed by a TUE, risks a long provisional suspension and a possible ban too. 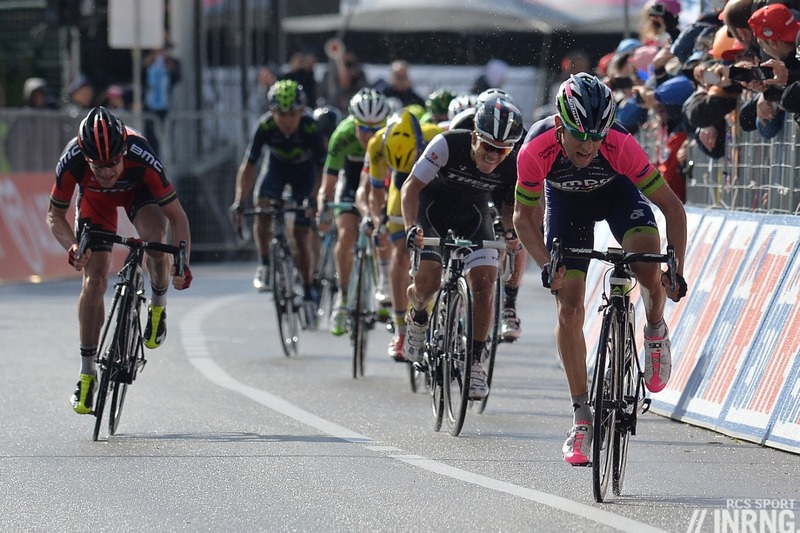 It’s hard to see this as a sneaky ploy by Lampre-Merida management to bend the MPCC rules or exploit a loophole. If he’s stayed on the team roster then he’s eligible to ride with his team once the ban ends. All this could be clearer if the MPCC rules were sharper and it’s communications clearer. Calling out Lampre-Merida in public to check Ulissi’s contractual position is clumsy, it could have checked in private before. But it’s not just the MPCC, we need clearer and faster anti-doping procedures, for example it shouldn’t take over six months to rule on his case and the reasoned decision seems to be private. We don’t know what caused Ulissi’s threshold-busting dose but the Swiss study linked above will worry any athlete using Ventolin. I agree with you here but we must be understanding of the MPCC and its apparent loop hole. Drafting rules for something as complicated as this sport is obviously very difficult and it seems the MPCC just never thought of this situation. They have to let Ulissi race and adjust the rules afterward if they want to. Everyone should understand that rules and laws must often be tested to be refined. Its a natural process. Thanks for clearing this up, INRNG. I read elsewhere about them keeping him on and the apparent confusion and dispute and thought to myself that it was rather clear that he hadn’t been “hired” as he was remaining with the team all along. In any case, does this mean he’s on a contract longer than the next two years? What happens then – does renewing a contract count as hiring or does it not matter if nobody who’d been banned changes team? I wondered the same thing, but as it’s a voluntary code, this set of circumstances hasn’t been tested before to my knowledge, and it probably wasn’t considerd when they wrote the rules, I suspect that they’ll “get away” with it for now, and the MPCC will consider whether they need to make the rules clearer in future. To use the French PDF it says “engager” which implies bringing on a new rider, hiring them, so maybe continuing with a rider by a renewal is ok. It shows how the rules need to be clearer. Thanks INRNG. I think you may be right as to what will happen – still chuckling at you calling him “Puff Daddy” previously too! Just more reason to believe MPCC should be renamed as – Movement to Minimize Doping Scandals in Cycling. We’ve seen plenty of dancing around and sidestepping so far, what’s another farce going to matter? MMDSC’s PR value? Fairly high. Credibility? Pretty low. I’d say it makes them more credible that they actually follow their rules instead of changing them ad hoc after what is preferred in a given situation. The recent Astana circus made MPCC and it’s rules look rather pointless. 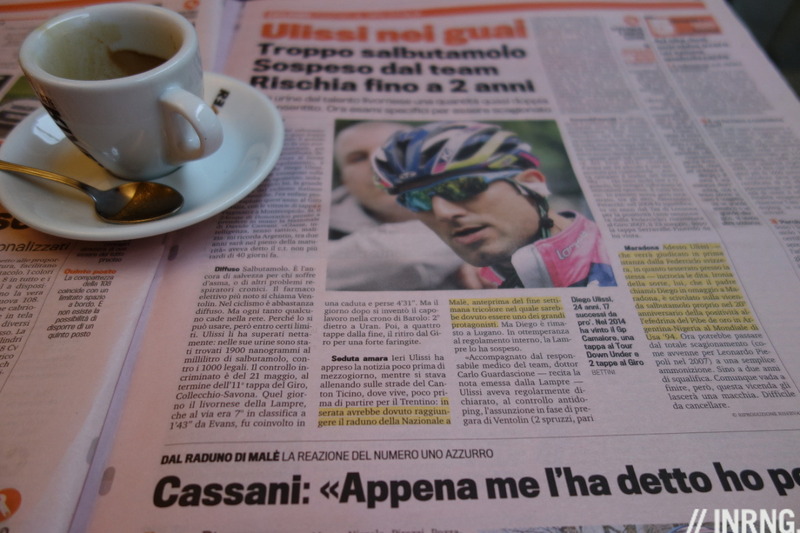 We’ll have to wait and see how this caper turns out, but the current confusion and back-and-forth with Lampre regarding Ulissi doesn’t raise their credibility in my opinion. Thank you very much for these informations. This is exactly the kind of information any jounalist should deliver (and almost none does, sadly!) so that the readers have real information and can decide for themselves what their opinion is. So did I get it right? the 1.900 ng/ml which – when put against the 999,99 ng/ml allowed under the WADA-Code – sound at first like an ecxessively high dose, is easily the amount you can have from using the inhaler in the way it should be used on a bad air day or during an effort by someone having asthma? Why did WADA draw the line so obviously wrong? Either allow the riders to take it in a way it really helps their medical condition or ban it at all. But this is -when I understand the chart right- nonsense! I hope WADA generally keeps up to date with new studies etc., so the Code gets adapted and makes sense. This is one very important part of Anti-Doping. I believe the usual recommendation for an asthma attack would be to take two puffs on an inhaler and not to exceed 4 in a day, this would likely not exceed WADAs doping threshold. 9 puffs in the space of a couple of hours is certainly not recommended, this study does not appear to be representative of therapeutic use. From my experience, you can take 2 puffs every 2 hours for as long as you want, not limited to 4 a day, i am still here after some pretty heavy use. The graph shows 3 doses of 3 over a 6-8 hour period. I would say that’s pretty common for someone suffering from bronchial problems, certainly I’ve had more than that with a bad chest infection. But I could barely climb the stairs never mind ride a bike! If i had minor chest problems and planning to race, like Ulissi, I would be taking that inhaler regularly, when i wake up, travelling to race, warming up, immediately before the start and during. I would easily exceed the level to keep my airways as open as possible, i have done it. I’m not naive enough to think pro cycling is whiter than white, but i could see this level being a problem. It worries me as i will be subject to testing at a competition later this year. The next question is how long is Ulissi’s current contract? If it expires at the end of this year, then Lampre or any other MPCC team can’t re-hire him until March 2017 right? Ulissi for team BMC in 2016?? I read somewhere that he is currently training with the team. Surely this is against the conditions of his ban? The standard therapeutic dose of ventolin is 2 puffs every 3 hours, if needed. For exercise specific asthma you’d be encouraged to bridge the exercise, but still with 2 hours between doses. Used on that basis, correctly, you should stay safely under the 1,000mg limit even if you’re under 60kg. It’d also be sound advice, unless you’re having a major asthma attack after the race, to not use your inhaler once you’ve been notified being called for doping control. Firstly, you can’t double dose (4 puffs every 6 hours say) because you’re then likely to spend a significant period over the threshold, as well as about 3 hours with little effective benefit. Secondly, it’s very easy to inhale it incorrectly (swallowing instead of breathing it into your lungs) and doubly easy if trying to use the inhaler during exercise (still breathing moderately) without using a spacer (which helps breathe it in properly). Using the inhaler incorrectly would leave the athlete still with the symptoms, but already over the threshold. Having a major attack and needing ‘nebulizer’ type treatment will almost certainly push an athlete over the threshold for much of the following 24 hours, especially if still administering ventolin periodically. UKAD had a case where a judo athlete had completed not long after recovering from swine flu, and who’d needed a nebuliser the night before. He’d stuck to the 8 doses on the moring but the leftovers from the night before. My guess is that Ulissi will have used his inhaler (for 2 puffs)) ‘a couple or a few times’ in the morning, feeling a bit ‘bronchial’, again possibly once or twice during the event before the finale, and then after the event. It’s only 2 puffs each time, but totals up well in excess of the 8 puffs over the last 12-18 hours that would keep safely under the limit. On a stage race it’d be common sense to carefully to ‘load’ allowable therapautic doses (4 lots of 2 puffs at 3hr intervals) around the racing (the biggest cause of the inflammation) and to avoid it overnight. you can easily rack up, 10-18 puffs in a day like that. Does anyone have the figures for how many professional riders have been diagnosed with some form of asthma and how the ratio compares to the general public? There was a report in the UK media back in December that the general public have about 8-10%, Team Sky had found a third of their riders were asthmatic, and the British Swimming squad found 70% have some form of asthma. Cross-country skiers are apparently quite high at around 50%. There have been suspicions that this allows riders to use an anabolic agent under TUE, even the small doses allowed don’t help much. But exercising outdoors in all weather with the fumes and so on can bring issues too. It’s a high ratio (don’t have the % here, sorry) of asthmatics in elite sport, but it’s predictable. Many asthma sufferrers (who would qualify on the basis of losing 15% or more of their lung capacity, as was required to be able to use asthma inhalers until only a few years ago) as a reaction to air irritation would be able to lead an entirely normal life without medication, IF they weren’t pushing their bodies to the limit in sport. When pushing your lungs hard, the unmedicated asthmatic athlete will typically get a disproportionate number of chest infections, have patchy form, flying some days tight-chested and going backwards others, and be very prone to things like pneumonia. Before Beijing 08, with the pollution worries, some countries will have checked all athletes being sent, and will have found quiet a few elite athlete asthmatics who had no suspicion they even had the problem. Athlete’s lungs will have a peak flow of 900 (l/min) or more, losing 25-30% (a bad reaction) still leaves a flow of 600, enough to not be out of breath for sedentary activity, but a huge reaction compared to the athlete’s own body (before you even start on the chest infection risk, etc). It used to be fiddly geting the spirometry tests done to be able to use inhalers, for an amateur at least, but now (instead) we have a dosage limit that basically requires the careful therateutic use of inhalers at a dose low enough to treat asthma, but not offer a performance advantage beyond treating the asthmatic symptoms. Too many extra puffs, through naievity or wreklessness, does however take you quickly from ‘legal therapeutic’ dose up into a potential performance enhancing, unecesssary and illegal dosage. Common sense tells me that you can’t compare it to the general public. The pertcentage of athletes, especially endurance athletes dealing with asthma (flue, too btw?) must be much higher than that of the general public. Only one paper, but it shows that there is a negligible improvement for people without asthma, even in high doses http://www.ncbi.nlm.nih.gov/pmc/articles/PMC1746141/ .